We've previously talked about Becky, the chatbot from Leeds Beckett University which was used to provide quick 24/7 responses during clearing for prospective students and even in some circumstances approve applications. It is such a hot topic JISC (a UK membership organisation providing digital solutions for UK education and research) is even running a hackathon today on the topic. Here we take a deeper look at automated communications (machine learning, chatbots etc.) in Higher Education from where it can be most usefully implemented to what the future holds for this technology. Automated communications and customer service are a relatively new way for students to get information but they're set to have a bigger impact on recruitment and for those already studying at University. Chatbots in particular are becoming popular because people like to talk naturally, including online to organisations and Universities and Colleges. Used in the right way, they're also extremely powerful. They can automate responses to commonly asked questions, are available day and night, are mobile friendly, and can seamlessly hand over conversations to support staff to handle more complex queries and requests. This refers to the design and functionality of the actual interface your audiences see when they use the tool. This is typically used to improve the accuracy and relevancy of answers to queries based on previous feedback and context. Whilst solutions can be implemented standalone, integrating with other systems can shift the tool from standard Q&A format to providing richer data with more uses. Where should we use automated communications in Higher Education? Automated communications are clearly not suited to all HE communications but they are proven to work really well in certain situations - for instance, where there are repeatable, predictable student troubleshooting needs. Ellucian, wrote a great blog on the topic and it is worth checking out. These cases allow for decision trees to be developed and the efficiency of handling the same query and response pattern can be improved over time. Automated communications are also particularly useful where there are multiple parameters. An example would be asking students a series of questions in order to determine what finance and support could be available to them. For most institutions the starting point will be to focus on students, particularly their needs during the application process and also to help with onboarding new students starting University. But over time their use looks likely to grow into other areas of support for existing students and perhaps also to help staff, with room bookings, IT, HR and other areas where there is a repeatable support need. 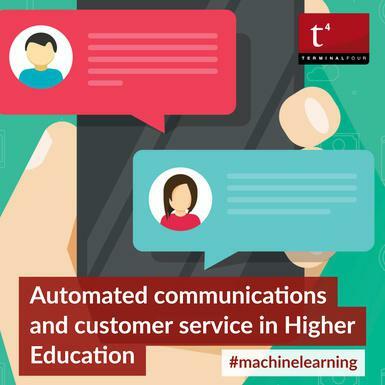 So what does the future hold for automated communications in Higher Education? Typically chatbots, virtual assistants and other forms of automated communications are in place to provide answers to routine questions. But over time we're going to see more transformative automated communications which can make a much bigger contribution to the overall student experience. Three things are going to make this change possible. Firstly, the sophistication of AI platforms such as AWS Machine Learning and IBM Watson is increasing all the time, with an improved understanding of speech, language variations, and the contextualization of queries. Natural language processing in particular continues to improve both by interpreting voice commands more intelligently and also by factoring in previous questions and the context in which questions are being asked. Secondly, there will be improvements in the way automated communications are implemented in Universities and Colleges. The use-cases will broaden out as more systems are integrated with chatbots and virtual assistants, from clearing and application support through to timetabling and room booking for current students. Thirdly, and this is the beauty of automated communications and AI, user feedback informs the relevancy and quality of responses and they get better over time as they become further refined, more targeted and relevant based on continuous user feedback. 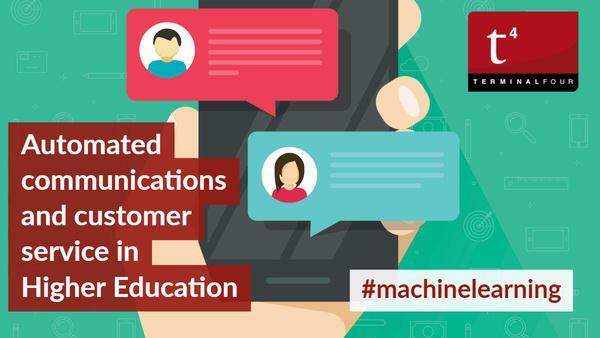 What's your view on automated communications and it's contribution to the student experience? We would love to hear of production or "hackathon" projects you are involved in? Let us know. And how important do you think it is as a channel for prospective students?